I’ve been watching a lot of Sharon Schamber on YouTube lately, she has a tutorial for y-seam 8-point inset stars, I thought I might use it to create my “Modern Mable” quilt. I have a few prints by Joanna Figueroa which I thought would be beautiful for this quilt, traditional but modern which is what I’m striving for. Sharon is very accurate, uses a lot of starch, a hard ironing surface and a dry iron. As you can see by my results, her methods work! My finished squares needed very little trimming and I think the more I make, the better I’ll get. I know these stars aren’t what the “in crowd” are into at the moment but I’ve only been quilting for a year and feel that learning traditional techniques are invaluable. Linking up with Freshly PIeced and The Needle and Thread Network. 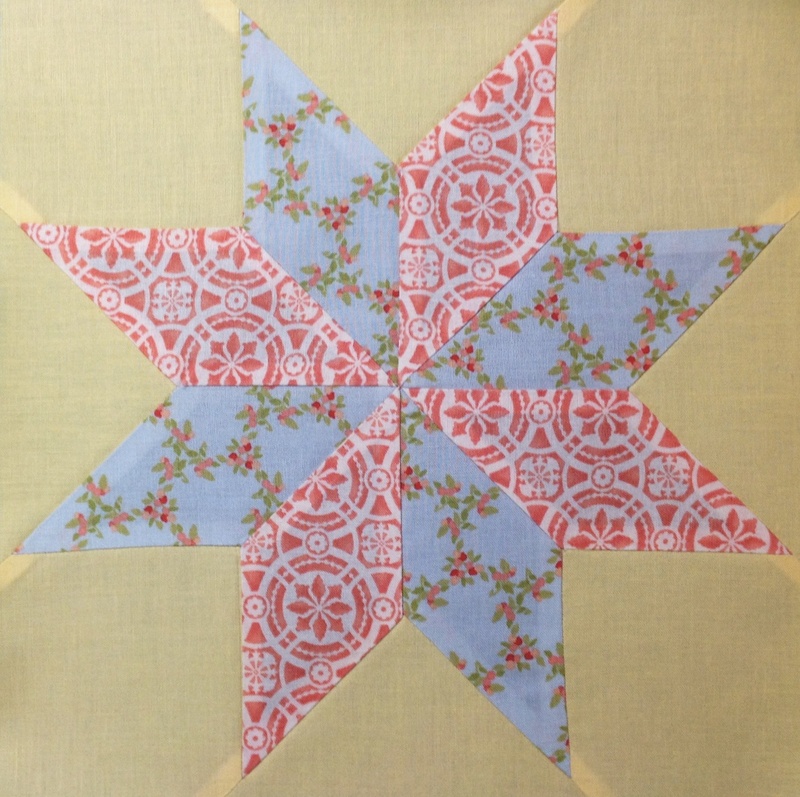 This entry was posted in Fabric, Piecing and tagged 8-pointed star, Joanna Figueroa, Sharon Schamber, Y-Seams by Tabatha. Bookmark the permalink. Thank you so much Kerstin, sometimes I really get caught up in the “in crowd” wave but never really feel “in” and that’s okay! xoxoxo! You may be thinking that Modern is the thing, but it is ALL based on Traditional! I love the traditional blocks and always return to them… Love your choice of fabric — any anyone can use a refresher of how to to do those pivots, they can be quite daunting! Thank you so much for your comment and support Susan! I’m not a traditional quilter per se but sometimes I really feel the techniques have been lost in translation. And thank you for taking the time to comment! You did such an amazing job…very accurate. Thank you! I’m really feeling the love from the quilting community! Sometimes I’m just not so sure of myself or my fabric choices. Thank you Mrs. Pickles, for taking the time to comment, I really appreciate it as well as your appreciation for traditional quilting methods! Who cares what is in! We should do what we like. I love your stars and the accuracy of your work! Set in is lots of work, but you succeeded! Your stars are perfect! I love traditional blocks. It looks like you press to one side – are the seams that meet in the middle pressed open? Hi Brye Lynn, for the center of the star I clipped through the middle of the bulk then pressed half one way and half the other, I take a photo and blog about that as it helps flatten the middle seams. Once all those “modern quilters” get more learning, they’ll be drawn back to the traditional soon enough anyways! Maybe with their own take on things, yes…I think there are some great fresh elements to what they call modern quilting these days, but I would agree that you should do what you feel like, and say who cares! You learn what you like as you go along, and with enough passion and conviction, anything can be “cool”! I love your comment Cathy, and your philosophy! I wish you had a blog so I could see your quilts!